are good irrigators. See this paper. The area under tidal irrigation of date palms on the Abadan Island, Iran. 1 - Is there global information on irrigation statistics, management, and environmental impact? This is a paper giving information on these irrigation subjects. See also Wikipedia on the statistical, managerial, and environmental aspects of irrigation. 2 - What about water management and soil salinity in alluvial fans or inland delta's? 1. Flood recession cropping in the molapo's of the Okavango Delta, Botswana. 2. 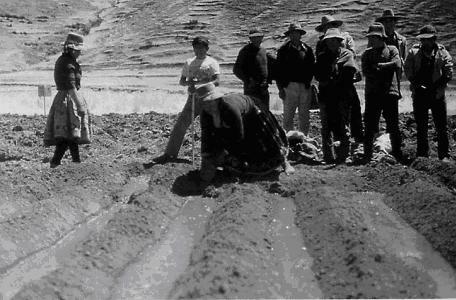 Irrigation projects in the alluvial fan of Punata in Bolivia. 3. Water management and soil salinity control in the alluvial fan of Garmsar in Iran. 3 - Is irrigation high up in the mountains feasible? This is a paper discussing the importance of irrigation at high altidues in the Andean mountains. 4 - What is tidal irrigation and how does it work? 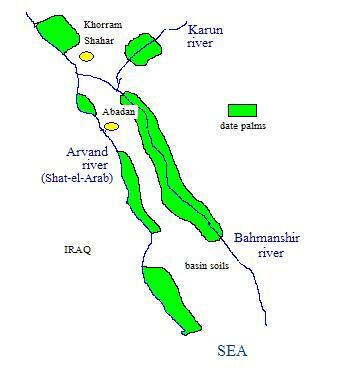 This is a paper in tidal irrigation of date palms in the Abadan Island in SW Iran. 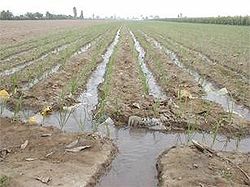 5 - What is the development of river salinity in downstream direction when, in arid and semi-arid regions, the salty river water is used for irrigation of agricultural land and the drainage flow and effluent are returned to the river, and what are the effects on soil salinity and how can eventual problems of salty soils be tackled? This is a paper on river salinity. The accompanying Excel spreadsheet can be downloaded. Further a powerpoint presentation is available. You may download it or otherwise see it on-line.